The quality of the varnish is superb, and this colour is gorgeous! It's the first time a violet shade looks good on me. Beautiful, bright colour with a shimmer that looks great under different lights. Resistant and good coverage, only two light coats needed. I adore this colour! It's gorgeous. I love how the colour changes in different lighting. The colour doesn't look dull after a day or two of applying but looks like its been freshly applied everyday. Totally in love with this nail polish. Definitely need a base coat and top coat for this polish as it adds to the intensity of the colour making it come alive. Illamasqua nail varnishes beat all other nail varnishes I have used hand down! I love this colour. Poke is bright, shimmery and totally gorgeous. I find that in person it matches the example swatches perfectly, the only noticeable difference being that in some lighting the shimmer seems pale blue rather than silvery - an effect that I personally find divine. 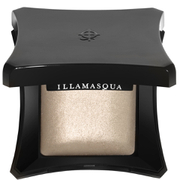 Like all the Illamasqua polishes that I've tried it applies very well and has minimal streaking.